The Bo Xilai controversy rumbles on, India fires a missile and the country’s train drivers are given an unpleasant new duty in this week’s round up of Asia news. Chatham House released a paper this week discussing how climate change will affect the Arctic, shaping a new geopolitical and economic environment. 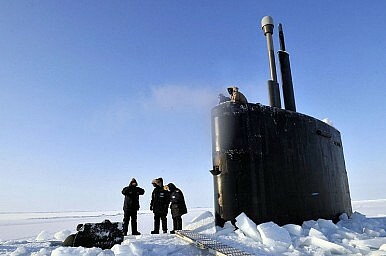 Authors Charles Emmerson and Glada Lahn argue that the fragile Arctic environment is likely to be adversely affected by economic development, while geopolitical sensitivities over territorial claims in the area are only likely to intensify. Melting ice caps in the Arctic also offer a potential alternative trade route to Asia, making this paper a invaluable read for anyone interested in Asian economics. "The resilience of the Arctic’s ecosystems in terms of withstanding risk events is weak, and political sensitivity to a disaster is high," the authors say. "Worst-case scenarios may be worse in the Arctic because the ability to manage evolving situations is limited by environmental conditions and the lack of appropriate infrastructure." Also this week, Cheng Li, a research director at the Brookings Institutions, looks at the Bo Xilai scandal and whether it could actually be a blessing for China. "Before the Bo crisis, there was great division among the leadership, intellectuals, and the public on China’s path forward. Now there is an opportunity to reach a new consensus and seriously pursue political reforms. This crisis has revealed the flaws in China’s political system, including the danger of allowing a demagogue like Bo to emerge, as well as the nepotism and corruption within the system." The scandal surrounding ousted rising star Bo Xilai continued this week, with the Chinese widow of murdered British businessman Neil Heywood having been gagged by local police in Beijing, Reuters says. Heywood was murdered last November, and Bo’s wife has been named a prime suspect. The whole affair has leftists up in arms over what they see as a political purge, but it has given Chinese Premier Wen Jiabao an opportunity to revive his claim that corruption is China’s greatest threat. Elsewhere, crippled rights defender Ni Yulan and her husband remained detained despite calls by U.S. Ambassador to China Gary Locke for their release. Wen’s call has more than a hint of irony, considering Ni was working to protect victims of illegal land grabs by corrupt government officials. Politics aside, China has proposed new music copyright rules that would give its government control over music royalties, including those from foreign music distributed in China. Meanwhile, there’s further proof that state companies still rule in China: CSR Corp, which produced the bullet trains that malfunctioned in the horrific Wenzhou train accident last year, was reportedly awarded a billion dollar contract for the Beijing metro. Across the Strait, Taiwan has called up its reserve troops for a military exercise that simulates a full scale attack by China. The exercise comes despite dramatically improved ties between China and Taiwan. Somewhere ties aren’t improving, though, is the South China Sea, where a row with the Philippines keeps rumbling on. Beijing this week summoned a top Philippine diplomat to discuss the “harassment” of Chinese fishing boats. Indian train drivers are protesting a circular that instructs them to remove dead bodies from train tracks to reduce delays. It’s a morbid but very real a real issue considering the high accident rate on Indian railways. Meanwhile, in a somewhat gruesome case of missing body parts, families in one north Indian state suspect organ trafficking abetted by corrupt hospital personnel, and have filed suits against the hospitals involved. Also in northern India, a couple decided to bury their own child alive. Why? Because it was written in the stars apparently. An astrologer told them that the ritual would prolong their child’s life. The infant survived, and is now in state custody. In Kashmir this week, Indian police questioned 16 men about Facebook posts that were supposedly inflammatory and anti-India. But a call by an Indian state minister underscored that the disputed territory isn’t the only place politics gets personal on the subcontinent. West Bengal Food Minister Jyotipriya Mallik says his party’s members should keep their daughters from marrying or even mingling with opposition supporters. We’re waiting for similar calls between the Republicans and Democrats sometime before November’s U.S. presidential election. India also made international headlines this week, with the successful launch of a long range, nuclear capable missile. While India has claimed the missiles are for deterrence only, their ability to reach major Chinese cities has caused some controversy in Beijing. The fallout continues from North Korea’s recent attempted rocket launch. Joel Wuthnow noted in The Diplomat that a very Chinese looking mobile missile launcher was paraded through the streets of Pyongyang last weekend. According to U.S. Secretary of Defense Leon Panetta, this should perhaps come as no surprise. “I'm sure there's been some help coming from China. I don't know, you know, the exact extent of that,” he told the House Armed Services Committee. But if China has helped North Korea fire a rocket, its advanced fighter deal with Russia is misfiring. The Diplomat reported recently that China was believed in talks to purchase 48 Russia SU-35 fighter jets for $4 billion, a deal that the Chinese side at one point denied. This week, media outlets declared the rumored talks “frozen.” China has a history of “borrowing” inspiration from Russian designs, and the deal may have stalled over Russian efforts to push for a large order. Speaking of orders, Russia's state agency for arms sales said this week that Asian countries have become Russia’s leading military technology buyers, VOA News reports, with 43 percent of Russia’s arms exports last year going to Asia. One of those destinations is Malaysia, which has just forked out $35 million on acquiring PBB-AE (P-77) air-to-air missiles. The IMF thinks that China is headed for a soft landing. Despite a fifth consecutive quarterly downturn in the first quarter, there was scope for optimism in certain March figures, including record steel output. The fund also thinks that a Beijing move to loosen its grip on exchange rates will help reorient the economy towards domestic demand. A Chinese strengthening will be a relief for Australia, which worries over the implications of a slowdown in demand for its commodities. For now, though, the IMF still sees Australia as the best-performing developed economy in the world, with growth of 3 percent this year. Japan has been among the worst-performing developed economies, ever since its bubble burst at the end of the 1980s. The man who burst that bubble, then-Bank of Japan Gov. Yasushi Mieno, died this week aged 88. Cambodia has opened a securities exchange; Burma is planning one. Singapore’s exports are down. The Reserve Bank of India surprised observers with a 50-basis-point cut in interest rates this week, with further cuts in the offing. Meanwhile, the Korean pop culture boom (known as hallyu) has created a new export industry: plastic surgery. Fans from its Asian neighbors are apparently flocking to South Korean plastic surgeons hoping to look like their Korean idols.